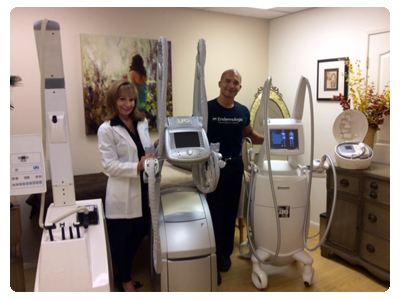 Body Care Professionals (BCP) is owned and run by Certified Endermologie® Technicians Pamela and Torie Lee. BCP offers clients a comprehensive solution to cellulite, a problem that plagues approximately 90% of women over 20. Endermologie® is an FDA-cleared, effective method for the temporary reduction in the appearance of cellulite and reduction of circumferential body measurements. Endermologie® has been featured in magazines like Vogue, Mirabelle, Mademoiselle, Shape and Newsweek. One of Hollywood's Best Kept Secrets. Since 1999, Pamela and her team at Body Care Professionals have been the endermologie technicians of choice of many actresses, models and those who simply want to look and feel their best every day. Recently, the team was elected for the 2012 Best of West Hollywood Awards in the Fitness category by the West Hollywood Award Program committee. Many leading plastic surgeons in Beverly Hills and Los Angeles recommend Body Care Professionals' Post-Surgical Treatment Program after body or breast procedures to help their patients heal as quickly as possible and enjoy their surgical results sooner. In fact, BCP now offers the most popular post-surgical products online as well, shipped directly to your doorstep. As owner/operators we have been extremely satisfied with every generation of LPG's products. We are looking forward to experiencing endless possibilities using our Cellu M6 Integral. Today, with so many different lasers and surgeries being available, our loyal clients truly appreciate LPG's technology that is 100% natural! Torie and I would like to thank all our satisfied clients for supporting our program, which is all about their Health and Wellness, along with other owner/operators of LPG's products . LPG's precise technology evolves with every generation of machines. We are proud to be a part of this elite group of professionals and having the opportunity to bring our clients the experience of the LPG's innovative expertise. Please contact us by email or by calling (818) 489-3532 if you have any questions or would like a complimentary consultation. Post-Surgical Products Available Online Now!